When you're running paid traffic, you need to have the right tools that can scale with you and your campaigns. I use to track all the various paid traffic sources. I have a permanent browser tab open for this tool…I'm constantly checking it! It's crucial to look at your stats and ROI, so you can cut the campaigns that aren't converting for you and scale your winning campaigns. What I Like Best: The dashboard is easy to understand the data and make crucial decisions. Templates are on Google servers. That means the load times for each template are the fastest on the internet. There are plenty of studies that show for each second a web visitor waits…he leaves. Implementation & Deployment: The templates are simple to use, elegant and they convert. I can deploy new templates within minutes and start driving traffic to them. Integration: They integrate with popular email autoresponders (like Aweber) and CRMs (like Ontraport & Infusionsoft) with ease. If you're not using an A/B split testing software, you're leaving TONS of money on the table. Now, LeadPages does have split testing capabilities, and I like to keep it all within Leadpages when I can. But if I'm working on a client campaign and it's on a self-hosted landing page, then I'll use VWO to split test headline titles, color variations and image placement to find the best performing layout for our paid traffic. What I Like Best: Just a simple piece of code on your site and you're make changes WITHIN Visual Website Optimizer. What I Like Best: There is a lot, but currently I like the Visitor Video Playback. It's fun to watch what people are doing! Wouldn't it be great to type in your biggest competitor and see all the banners they're running on the entire internet, what websites they're putting those banners on and what landing pages they're sending people to with each banner? Well…there is! When starting a banner campaign within Google Display Network (GDN), Native ads (Taboola/Outbrain) or Media Buys for a client, we take a look at their top competition's placements and banners within WRW. We'll typically create banners that look similar and start placing those banners at the websites they've been advertising on the longest. Once they've seen positive ROI, we continue to branch out to more websites. What I Like Best: The ability to see your competition's top websites and how long they've been advertising at those websites is pure gold. 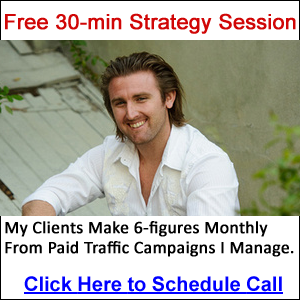 Would you like me to use all the tools above and build you a paid traffic campaign that generates you leads and sales? Schedule a 30-min strategy session and let's discuss. Case Study: How We Increased Click-Through Rate (CTR) by 250% and Doubled Leads! © 2017 paidtrafficarchitect.com. All Rights Reserved.